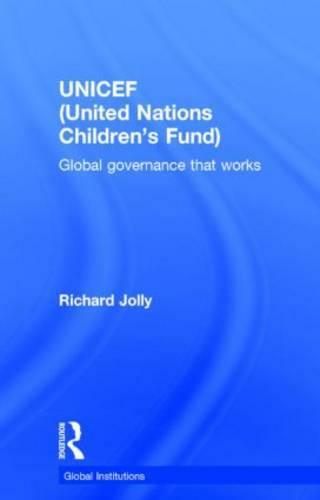 This book provides an in-depth analysis of UNICEF's development and operations, whilst exploring the significance of UNICEF's achievements and the reasons behind them. UNICEF is one of the best known organizations of the United Nations system and the oldest of the UN's development funds. It is also the part of the UN which consistently receives support from all countries round the world, including the United States. This book brings out the wider reasons for UNICEF's success and popularity, setting them in the context of UNICEF's evolution since 1946 and drawing lessons for other international organizations. The book argues that, despite its problems, international action for children, built substantially on non-economic foundations, is not only possible, but can be highly successful in mobilizing support, producing results and making a difference to the lives of millions of children. This will be of great interest to all scholars of international organisations, development, human rights and the United Nations system. Moved and led by the visionary Jim Grant, UNICEF has been one of the biggest contributors to a better world, as well as a pioneer in making us understand how social change has to be assessed and evaluated, and what can be practically done to accomplish what most people thought could not be achieved. This book, by one of the leading players in UNICEF's efforts and attainments, is a gripping account of firm-footed progress in a world of adversity. This is a success story that deserves to be known, partly for further and continued progress in the lives of children as well as adults everywhere, but also as a definitive challenge to premature - but widespread - pessimism about the pursuit of the global good. Amartya Sen is Thomas W. Lamont University Professor, and Professor of Economics and Philosophy at Harvard University. Richard Jolly is both passionate advocate and careful analyst of UNICEF. He was part of its leadership during its years of world changing glory under Jim Grant and then academic observer of a later UNICEF that has operated in harder times. In this highly readable volume, Jolly explores the lessons for leadership in the UN and powerfully calls for applying these lessons for humane global governance in the wider world." Mark Malloch-Brown, former UN Deputy Secretary-General.